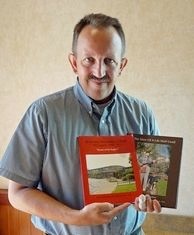 With those simple words, Snohomish writer Ken Hammond has helped scores of people begin reminiscing over a cup of tea or coffee in their kitchen or living room and captured the most important memories of their lives, feelings, challenges met, families raised or careers remembered. For all of those who wish they could write their life story before it’s too late, who want to share their life histories with their families and friends, Hammond provides the incentive, skills and talents needed to preserve those memories in a variety of forms. Everyone has a life story worth telling, he believes, but he also knows most people don’t know how to transform those memories, genealogy and events into a book or other format that can be shared with family today and generations to come. That’s where Hammond steps in to help. His own life experiences have given him the insight needed to see into other people’s lives, to know what to ask and how to explore the road map of their life’s travels. Hammond retired as an Army first sergeant after a 20-year career. Married to his wife, Rochele, for 21 years, he’s helped to raise three boys: Josh, 17, a senior at Snohomish High School; Jake, 16, a junior at Snohomish High; and Braden, 12, a student at Centennial Middle School in Snohomish. Realizing what a great loss those memories were, he began writing other people’s life stories to give them an opportunity to preserve their important memories before age, accidents or sudden ailments intervened. His fees are $50 per hour throughout the interviewing, editing and publishing process. The time frame can span anywhere from four weeks to six months, he said, as he flipped through the pages of a thick volume on the life of the late Ken Schilaty, a prominent Snohomish real estate agent who had a far-reaching impact on the region, his family and friends. For a one-page, framed wall mounting of a special event, life story, business career, athletic career or anniversary, Hammond charges $400, presenting the story on special acid-free paper, custom-matted in an 11-by-17-inch cherrywood or black frame. Hammond doesn’t sell or market people’s books, he said, but he gives them tips on how they can do that themselves if they’re interested. What Hammond finds rewarding is that he offers services that go far beyond writing a person’s life story. Hammond does it in a way that it becomes a treasured family memory, often including photos and recordings. He also presents life history workshops at retirement centers. Hammond recently published a do-it-yourself guidebook that will walk people through all the steps of creating and preserving a life story. For more information, go to www.hammondscribe.com or call Ken Hammond at 425-345-4928.